1. The story is as old as they come, biblical even. Who's the best Universal movie monster? Don't make me slap you. Siodmak was a German Jew who escaped the Nazi rule in his own country to come to Hollywood, where he continued his work as a screenwriter. When Siodmak was commissioned to pen the script for The Wolf Man, he included “the mark of the beast”- a pentagram (seen only by cursed individuals) that signifies who will be the next victim. The pentagram-bearer is marked for death. As a Jewish man having slipped away from the Nazis, Siodmak knew a little something about people marked with stars/pentagrams who were marked for death. He later pointed out that, when writing about this creature that could turn on a dime from a likable person into a horrible monster capable of atrocities, he was referencing the copious amounts of Nazi sympathizers in Germany who, overnight, went from being friends and neighbors to Jews to supporting genocide. Even a man who is pure at heart, and says his prayers by night, may become a wolf when the wolfbane blooms and the autumn moon is bright. Claude Rains was in it. Bela Lugosi was in it. Chaney, Jr. was in it. None of the other creature features had that much monster star power. All that was missing was Karloff and they would’ve pulled off the Grand Slam of Monster Actors. Even Maria Ouspenskaya was perfect in it as the gypsy woman. The foggy moors, deep shadows, visual contrast, Gothic architecture… stylistically, does that sound familiar? It sounds a lot like film noir. It’s tough to give The Wolf Man sole credit for this, as Dracula and Frankenstein/Bride of Frankenstein employed the same techniques at an earlier time than The Wolf Man. Nevertheless, it was a worthy successor in this regard to Dracula/Frankenstein/Bride of Frankenstein. And these films all served as a vital part in Hollywood’s stylistic evolutionary chain, linking up the mise en scène and expressionism of silent European films in the 20’s with film noir in the 40’s and 50’s. It’s built right into the whole concept. A man starts off as, well, a man. Then events happen- he’s bitten by a wolf, the moon comes out- and he winds up somewhere else entirely (as a beast, half man and half wolf). I know it’s Film School 101 stuff, so it’s not particularly deep or insightful on my part to point it out, but I still think it’s worth noting. So there you have it- the case for why The Wolf Man is the alpha dog of Universal Studios’ creature features. And that’s quite a feat, really, because each one of those original Universal horror films was excellent in its’ own way. 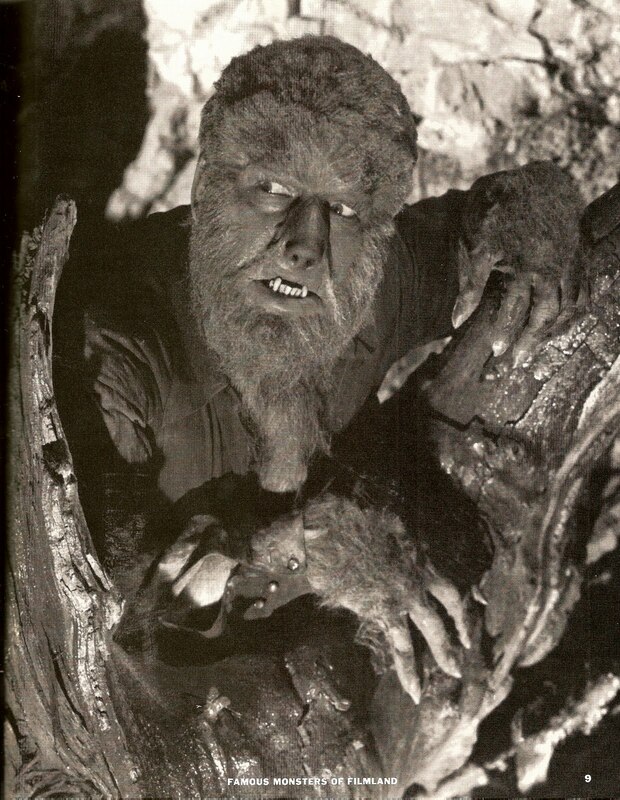 It’s easy to dismiss The Wolf Man as hokey Halloween fun but it’s so much more than that. Hmmm.. “Wolfman” is good.. but the original “Invisible Man” might just be the best.. and that’s coming from a Karloff/Frankenstein freak.. so don’t make me slap you.. The Invisible Man was definitely one of the top five invisible movie characters of all time. Without a doubt. Great review of The Wolf Man. It’s interesting how you see the werewolf monster in biblical connotations that makes it differ significantly from the monsters produced primarily through science-gone-bad, ie. Frankenstein, Creature from the Black Lagoon. Indeed, I find this aspect far more interesting than the Freudian influences thrust upon the vampires. What really won me over was when I found out about the Holocaust thing. For years, I had seen The Wolf Man as a fun but campy little horror movie, lacking bite (PUN INTENDED! wokka wokka!). But it’s analogous to Germany in the late 30’s… which I find astounding.